Feeling a little thirsty after another fabulous Monday, I turned to my local provider for something new. I opted for Leinenkugel’s Oktoberfest. This is a lager in the tradition of a German style Marzen. As I was not familiar with the Marzen style, I consulted Wikipedia and discovered that this style is characterized by a medium to full body, a malty flavor and a clean dry finish. In Germany, the term covers beers which vary in color from pale (Helles Märzen), through amber to dark brown (Dunkles Märzen). Here in North America, the Marzen style tends to exhibit a stronger, though not aggressive, hop aroma and bitterness balance. 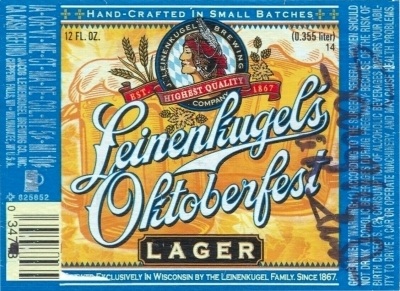 A seasonal selection available in September and October, Leinenkugel’s Oktoberfest (ABV of 5.1%) fit this description to a tee. From the bottle, the amber pour builds nice foam that does not quickly dissipate. The aroma is at first a little hoppy but is soon followed by a combination of caramel malt and citrus. The flavor is engaging and mouth feel is mild without being watery. With a smooth finish this is a drinkable beer. While not the best Oktoberfest I have had, it certainly wasn’t a bad lager. I would give it a B-. G-Lo, you are spot on — this is a favorite here in Milwaukee this time of year, but we have some other local brews that are better. Can’t take credit for this review Stan. This one was written by my fellow “booze dancer” Limpd. Haven’t had the this particular Marzen. I had a Stoudt’s draught version on Sunday. Really really good! So it was…sorry Limpd, next time I’ll try to read the credit line!